We review the literature on co-occurrence of syncope and headache and share clinical experience. Headache in relation to syncope has been the subject of recent interest. Orthostatic intolerance has an expanding spectrum with three well-defined entities: orthostatic hypotension (OH), neurally mediated hypotension (NMH), and postural tachycardia syndrome (PoTS). Syncope occurs in patients with OH as well as in patients with episodically occurring NMH. Headache of OH is called coat-hanger ache (CHA) because it affects the neck and shoulders in a coat-hanger pattern. It can serve as a warning symptom of OH as well as a parameter to gauge the benefit of treatment. Awareness of CHA avoids inappropriate tests. Headache type occurring in NMH has not been fully delineated. 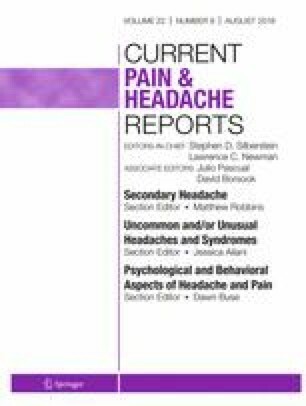 A questionnaire-based study describes migraine leading to syncope and treatment of migraine to reduce syncope. Laboratory studies in NMH patients provide evidence for only short-duration headache. The author’s approach to such patients is presented. Ramesh K. Khurana declares no conflict of interest.